'The Hunt' continues to pick up momentum as Orla delves deeper down the rabbit hole and her brother goes missing. In the last issue, Ollie went for a snack and came across a mysterious man. Someone Orla knows and hasn't been seen since. 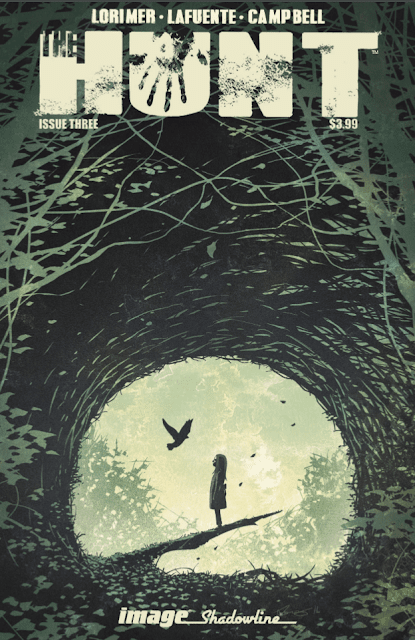 Searching for Ollie becomes the crux of issue three that leads Orla down a dark and familiar path. Creator Colin Lorimer has established an eerie tale based on Celtic mythology and while there have been some suspenseful events, we're finally being immersed in that supernatural world. Lorimer as writer and artist lays out a haunting anxiety-ridden story with as much or more with incredible art than just words alone. He works in thick lines and heavy shadows. I've compared him to Michael Gaydos and Michael Lark but Lorimer adds his own style. The stunning backgrounds are dense, beautifully lit, and sometimes semi-realistic. Joana Lafuente's colors add both a spooky veneer and an ethereal look to some of the scenes. 'The Hunt' escalates the conflict between Orla and the dark forces that have haunted her life. A grandmother in serious condition, a kidnapped brother, a precarious situation hanging by a magic spell, and Orla's deep into enemy territory. 'The Hunt' keeps getting better and the payoff is right around the corner. It's a beautifully illustrated story of suspense that deserves your attention.